Categories: Reforming the Energy Vision (REV), Renewables, Renewables News. Keywords: Solar, Solarize. NRDC and our partners filed comments today with the New York State Public Service Commission, which regulates the state’s utilities, that can help the Empire State lead the nation in renewable energy–that’s right: lead the nation–by building on the state’s existing successes and creating what’s technically called a Renewable Portfolio Standard (RPS) that will enable New York to get 50 percent of its electricity from clean sources, like wind and solar power, by 2025. (Thanks to the state’s existing renewable energy standard, set to expire at the end of this year, and the abundant hydropower resources from Niagara Falls, New York already gets more than 23 percent of its electricity from clean sources. The 50 percent target is eminently reachable, as illustrated by NYSERDA’s recent renewable energy potential study.) A 50 x ’25 RPS is what New York state needs to maximize the state’s sizeable clean energy potential, comply cost-effectively with the EPA’s Clean Power Plan to cut carbon pollution from existing power plants, and meet New York’s existing commitments to cut greenhouse gas emissions by 80 percent by 2050, as science demands, if we are to protect our kids from climate change’s worst effects. Unless you’re an energy wonk like me, filing comments might not seem like a big deal. But the truth is, these comments can help New York shape its clean-energy policies so that the state beats even California, the current nation-leader, in clean power; so that it can create hundreds if not thousands of good jobs, especially in economically struggling upstate communities; and, if past performance is any guide, so it can realize three dollars in economic benefits for every dollar invested–quite an impressive rate of return. Most importantly, pushing for this 50 X ’25 standard will help guarantee that, as the state’s current renewable energy standard expires on December 31st, and New York redesigns the ways electricity is generated and delivered, through the complexReforming the Energy Vision proceedings, we’ll have the right policies in place to make New York’s electric system cleaner, more reliable and more affordable overall. If we want large-scale, clean-energy developers to set up shop and develop projects here, like the country’s biggest solar developer, Solar City, did in Buffalo last year, and we want to create new jobs (3,000 are expected once the Solar City plant opens in 2016 or 2017), we need the kind of long-term certainty that an ambitious renewable energy standard, and only a renewable energy standard, provides. New York already recognizes the benefits of large-scale renewables projects that RPSs spark. 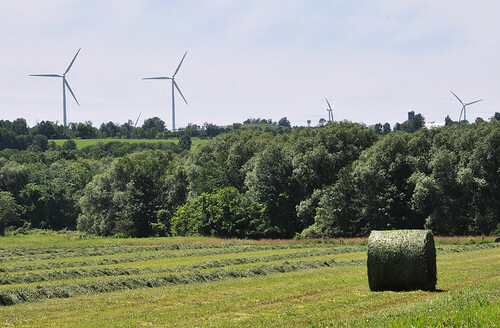 Indeed, last week, Governor Cuomo’s office announced the state would offer $160 million in large-scale renewable energy investments through a competitive process. This offering represents the tenth solicitation since the RPS was established more than a decade ago. (Through this so-called “main tier” solicitation, winning projects will be able enter into contracts for as long as 20 years.) Earlier main-tier solicitations have already resulted in the creation more than 2,000 megawatts-worth of renewable energy projects in the Empire State. Many of them are located upstate, where they’ve not only helped create jobs in sluggish local economies, but have also supported vital public services like education and public safety by paying taxes to local governments, and kept families on land that has often been in their families for decades. Again, all of this progress has been supported by an extremely modest investment by New York consumers, an investment that has delivered a striking 3:1 benefits-to-costs ratio, as data collected by NYSERDA demonstrates. Finally, as the PSC and NYSERDA develop their renewable energy policies, they should be sure to include Long Island in their mandates and standards. (The area is currently exempt.) Because Long Island creates nearly 20 percent of the state’s overall electric demand, New York simply can’t meet its clean energy or climate goals without Long Island doing its part. Considerable research demonstrates that RPSs have been–and continue to be–the most significant drivers of renewable energy development in the nation. So, in order to achieve its clean-energy and carbon-cutting goals, New York needs to create a new and improved RPS as the old one expires. Our comments to the PSC provide some guiding, overarching principles that outline how to effectively design an ambitious standard that creates new jobs for New Yorkers, helps the state comply cost-effectively with the EPA’s Clean Power Plan and existing New York state commitments to reduce greenhouse gas emissions, and maximizes the state’s clean energy potential. With a 50 X ’25 RPS in place, New York will lead the nation in clean energy; a multitude of benefits will come with it. via New York Can Lead The Nation In Clean Energy With A New, 50 Percent By 2025 Renewable Energy Standard | Kit Kennedy’s Blog | Switchboard, from NRDC. Categories: Building Owners, Contractors, Generation, Solar, Solar News. Keywords: NY REV, NYSERDA, Reforming the Energy Vision, Solar, Solarize. Solar power is on the rise across New York, where it has grown an average of 44.28% annually in the last three years. According to the latest solar jobs census from the Solar Foundation, the solar industry employed more than 5,000 people in New York in 2013. Significantly, New York ranks fifth in the nation for statewide solar job creation. New York will continue its prodigious growth with the NY-Sun initiative which has committed $1 billion in funding for solar projects. The newly launched Solarize campaigns bring together widespread community outreach and education, competitive installer selection, and a limited-time offer to bring more customers to solar and provide significant cost savings. Community Solar NY will support these campaigns by providing marketing materials, technical assistance and funding and by sharing best practices to help community projects succeed. With the highest electric rates in the nation, lower costs and new funding – NOW is the best time ever for New Yorkers to invest in solar! Categories: Contractors, Contractors News, Financing, Renewables, Solar, Solar News. Keywords: NY-Sun, Solar, Solarize. New York rose to 4th in the country for solar jobs according to the Solar Foundation’s NY Solar Job Census which noted that a robust increase in installations continues to drive solar employment growth. As of November 2014, New York employs 7,284 solar workers, at higher than average solar wages, representing a 39.8% increase in employment over the previous year. Solar employers across the state are looking forward to strong employment growth in 2015 as well, expecting a 29.5% increase in the solar workforce over the next twelve months. The census also reported that solar firms in New York hire more veterans and African-Americans when compared to the national average for the solar industry and about one-fifth of recent hires for solar jobs in the Empire State were women, and nearly 12% were Latino or Hispanic.